Give a man a fish and you feed him for a day. Teach a man to fish and you feed him for a lifetime. That's the idea behind Medical Dental Community Groups, a nonprofit that is creating a homegrown network to provide basic oral health care to some of the world's poorest people. Founded in 2006 by Doug Leung, A78, D81, the group is teaching residents of impoverished regions of Southeast Asia how to perform simple dental procedures. In turn, the trainees provide their neighbors with these basic oral health services. By instituting a training continuum, Leung hopes to establish a sustainable corps of oral health-care providers throughout the region. "In my travels, I've been to a lot of places where you can really see how underserved these people are," says Leung. "The only way they can get help is through the government or nonprofit organizations, and these are often pretty sparse offerings." In 2004, the World Health Organization (WHO) reported that tooth decay, gingivitis and oral cancers-all preventable ailments-remain global health problems that disproportionately affect the poor in industrialized and developing nations alike. In Vietnam, the WHO found that more than 80 percent of six-year-olds suffer from tooth decay, compared to about half of American kids that age. "You can see when you travel that so many people in their twenties have missing front teeth and rampant caries [tooth decay]," says Leung. A possible explanation is that Asians are increasingly eating western-style diets, high in refined sugars and carbohydrates, without the benefit of western-style oral health care. So Dr Leung is approaching the oral health problem abroad using the same strategy that public health officials employed in the United States in the 1950s and 1960s. "We already learned in the U.S. that prevention is the best way," says Leung. "In many parts of the world people say, 'My teeth don't hurt, so why do I need to go to the dentist?' So we don't see them until they have a crisis event." Emphasizing education and prevention, Leung developed a three-day course to teach non-dentist volunteers how to perform exams and cleanings, do simple fillings, apply fluoride and sealants and offer home-care instruction. Da Nang, Vietnam, in the basics of oral health care. Using his basic curriculum, in 2006 and 2007 Leung trained 22 Vietnamese volunteers from two organizations: Love of Vietnam Expressed (LOVE) and the Da Nang-based Street Children Program, a non-governmental organization that works with that city's homeless children. To make his project work in very rural places, Leung pared down a dental tool kit to just headlamps, some hand instruments, composite material and a light curing wand. He tinkered with jury-rigged headrests, but these proved difficult to carry on the motorcycles commonly used to get around in Vietnam. In the end, school chairs and benches cushioned with pillows worked just fine. "We can do this in schools, churches, clinics-any place poor people go," says Leung. "We just need volunteers and local supplies." After several visits to Da Nang, Leung says the program is up and running, though in need of both funding and a permanent local administrator. By training local people rather than relying on visiting volunteers, Leung's group leaves a permanent legacy behind. It also neatly avoids language barriers and cultural misunderstandings, and offers a better model than most foreign aid, he says. "When we hear about natural disasters, people go in to help," says Leung. "But the need persists after the outside aid stops. I want the locals to continue to have leadership over the program and their destiny." Leung grew up poor in Somerville, Mass., in the shadow of the university he would one day attend as an undergraduate. Always good at science, he knew he wanted to help people and decided to become a dentist while he was still in high school. After graduating from Tufts Dental School in 1981, he set up a general dentistry practice in Brookline, Mass., where he lives and works today. But, as a religious Christian, he's looking to broaden his impact. "My kids are grown now, so I have time to go out and do what's really needed," he says. Right now he believes he's really needed in the Philippines, where he has been invited to establish two more homegrown dental-care programs in Bacolod City and Mindanao, places far from the capital, Manila, where poor people often live on top of garbage mounds on infertile land. Working with International Care Ministries (ICM), an aid organization already established in the Philippines, Leung hopes to bring a group of volunteers from a Vancouver church group to the island nation in January 2009. He would also like to get programs up and running in Haiti, Cambodia and Myanmar. Aid groups in China have also expressed an interest in having Leung train locals to take care of their neighbors. "I would go wherever there are poor people," he says. "We just want to help as many people as we can." For more information about Medical Dental Community Groups, visit www.mdcg.org or e-mail Doug Leung at drdwleung@yahoo.com. Reprinted with permission : Jacqueline Mitchell may be reached at jacqueline.mitchell@tufts.edu. 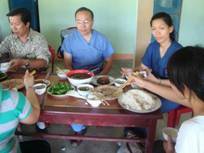 During the very last days of 2009 and the first 2 days of 2010, LOVE was honored to have Dr. Leung and friends visiting and going out to the field to do dental aid with us. This trip, Dr Leung has trained about 20 volunteers to apply sealant on permanent molars to prevent cavities. During the 4 days we worked, about 400 children were seen. Below are some pictures.